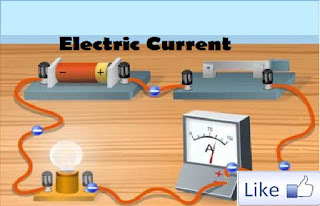 Electrical current is the flow rate of electric charge in electric field, usually in electrical circuit. Using water pipe analogy, we can visualize the electrical current as water current that flows in a pipe. The electrical current is measured in ampere (amp) unit. The momentary current is given by the derivative of the electric charge by time. i(t) is the momentary current I at time t in amps (A). Q(t) is the momentary electric charge in coulombs (C). I is the current in amps (A). ΔQ is the electric charge in coulombs (C), that flows at time duration of Δt. Δt is the time duration in seconds (s). The current IR in anps (A) is equal to the resistor's voltage VR in volts (V) divided by the resistance R in ohms (Ω). Current that flows through resistors in series is equal in all resistors - just like water flow through a single pipe. ITotal - the equivalent current in amps (A). I1 - current of load #1 in amps (A). I2 - current of load #2 in amps (A). I3 - current of load #3 in amps (A). Current that flows through loads in parallel - just like water flow through parallel pipes. The junction of several electrical components is called a node. The algebraic sum of currents entering a node is zero. Alternating current is generated by a sinusoidal voltage source. f - frequency measured in hertz (Hz). i(t) - momentary current at time t, measured in amps (A). Ipeak - maximal current (=amplitude of sine), measured in amps (A). ω - angular frequency measured in radians per second (rad/s). t - time, measured in seconds (s). θ - phase of sine wave in radians (rad). Current measurement is done by connecting the ammeter in series to the measured object, so all the measured current will flow through the ammeter. The ammeter has very low resistance, so it almost does not affect the measured circuit.